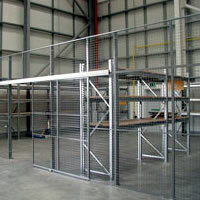 i-Rack Storage Solutions Mesh Partitioning provides the answer to your security needs by dividing and securing areas. It is easily installed yet provides a rigid and secure partition system. The wire mesh design allows clear visibility without restricting light and airflow.